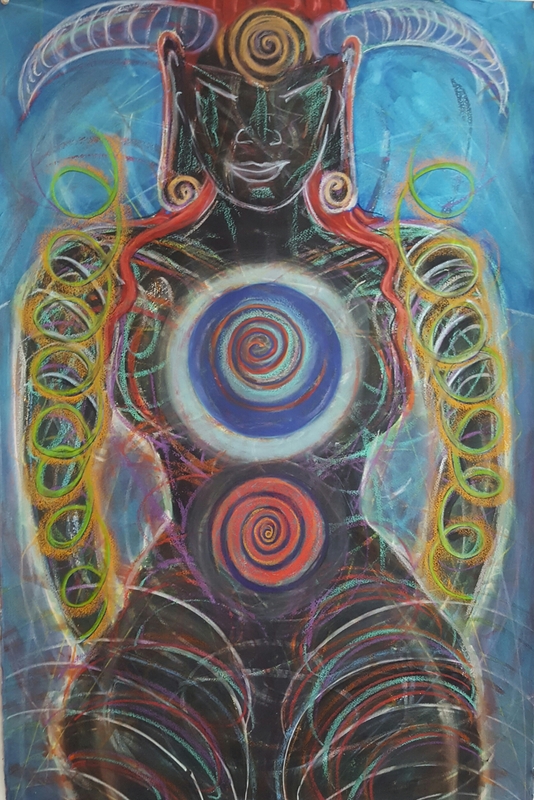 My artwork is grounded in the body, the kinesthetic: movement, music, and dance — and also in its subtle forces — emotional, spiritual and healing energies. The quest to reveal the underlying energy source runs through all of my work– like the Sufis I find no separation between the divine and the body. Recently, I taught a four session class at the Rubin Museum of Art on Creating Your Own Deity. We started by looking at deities from all over the world and physically getting into their postures and stances – this way we could to feel the impetus of each deity, its strength, rage, balance or peace. 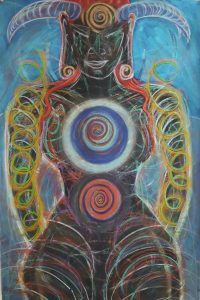 We then created our own deities starting with our own body’s energy. As in my own work, our mainly Western perspective created new ways of manifesting traditional images that exemplify states of being. And why is this art work be important? We live in a time of much anger and violence, and communication is often disembodied. The disconnect between ourselves and the natural world is causing serious problems. We need to come home to our bodies, our animal-ness, our human-ness, our body-temples. I worked for 18 years as an expressive arts therapist at Sloan Kettering with adult cancer patients, and I understand that there are times when it is advantageous to not be in our bodies. 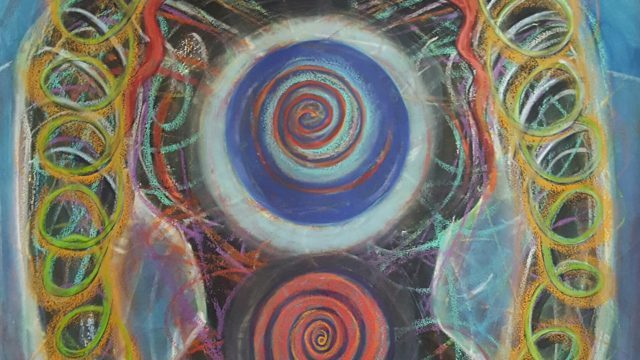 However, fully inhabiting our bodies as part of Gaia gives us knowledge of ourselves and our home, with the opportunity for healing and connection. During Luminous Bodies, I will be exploring the energies of the body with translucency, transparency, color both iridescent and interference. Also involved will be bones, dance, chakras, sutras, music, deserts, ancient voices, space and flight. Janet Morgan has traveled, painted and taught in many places. She has created a pantheon on 200 deites and taught others to create their own at the Rubin Museum of Art, The Chapel of Sacred Mirrors and the Art Students League in New York City. She has done a number of residencies, including Death Valley National Park, the Babayan Cultural Center in Turkey and a teaching residency for the last twelve years The Omega Institute. She bellydances and teaches drawing bellydance, and she spends a lot of time in the desert. She has lately been fascinated by trees.